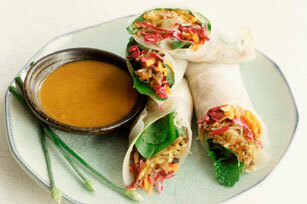 Filled with fresh colourful vegetables and herbs for a wonderfully fragrant treat, our Spring Rolls with Spicy Peanut Sauce are an awesome appetizer recipe for your next party. Your guests are sure to love them! Prepare rice noodles as directed on package; drain. Rinse under cold water; drain well. Place in large bowl. Add 1/4 cup dressing mixture; mix lightly. Spoon about 3/4 cup noodle mixture onto one end of each rice paper sheet; top with remaining ingredients. Roll up each sheet, starting at noodle-topped end and folding in both sides of sheet as you roll it up to completely enclose filling. Place, seam side down, on platter. Serve with remaining sauce for dipping. Substitute 3 cups shredded red cabbage for the radicchio.